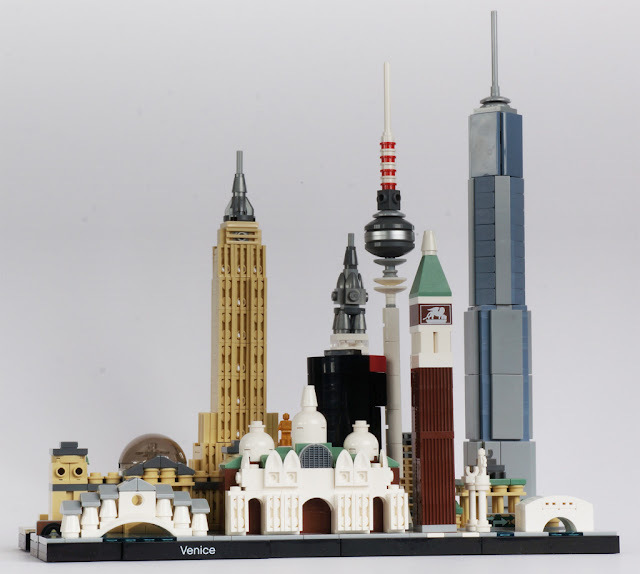 Sets 21026 Venice and 21027 Berlin have approximately the same piece count - 212 and 289 respectively - whilst 21028 New York is more than double the piece count at 598. 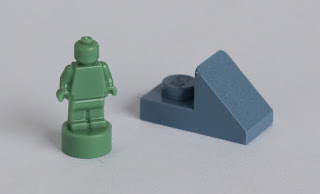 Each of the models' footprints are the same (with minor variations): a base measuring 4x32 studs with a row of tiles attached sideways to the front. I say minor variations because Berlin and New York extend out at the back to accommodate parts of the models, as shown below. These bases look really smart, especially as the Black 1x8 tiles printed with the name of the model (a signature of the Architecture theme) project outwards by one plate. (The Element IDs for these tiles are Venice: 6135202, Berlin: 6135307 and New York: 6135412). 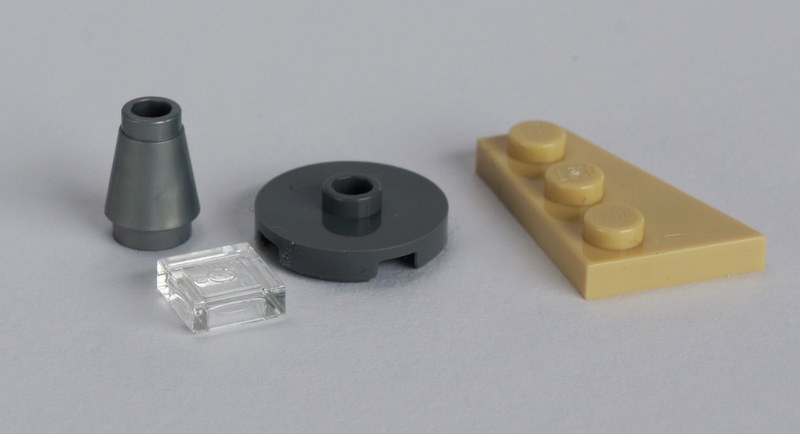 Two of these three sets are improved by the inclusion of additional printed elements and all three of them contain a few interesting recolours of elements too - most notably the minifigure trophy in three new colours, with a spare included of each! Let's take a close look at what is on offer in each of the three sets. Included (from left to right) are the Ponte de Rialto (Rialto Bridge), Basilica di San Marco (St. Mark's Basilica), Campanile di San Marco (St. Mark's Campanile), two columns with statues of the Lion of Venice and St. Theodore sans crocodile, and Ponte dei Sospiri (Bridge of Sighs). This build is the most basic of the three sets, with only St. Mark's Basilica providing a little interest in the form of some basic SNOT and the clever use of a 2x2 round tile printed with a grille. The construction of the rear half of the church (in Reddish Brown) includes 2x4 bricks; it is pleasing to see five of this iconic element used in a small microscale set! An opportunity for additional interest was passed over here, however - rather than using 2x4 bricks, some detail could have been added within the white arches. It isn't necessary though; the simplicity of the set is a big part of its charm and the consistent colour scheme makes it very attractive to display - a fact which may draw some to purchasing it over the other available cities. It's worth noting that St. Mark's Basilica is, of course, a religious building - a subject which TLG usually avoid. It would be interesting to hear the internal discussions that presumably occurred about this! My guess is that they felt comfortable about including it, since it is a part of the set rather than the complete focus, alongside the overall context of the set being a souvenir of the city's landmarks rather than a celebration of the Roman Catholic faith. St. Theodore, resting his arm, is represented by the first appearance of our minifigure trophies: in White (Element ID 6073432 | Design ID 90398 and others). I imagine this will be massively popular, especially with third party minifigure customisation companies! I was surprised to discover that this is the first set ever to include the 2x2x2 75° pyramid slope in Sand Green (6136563 | 3688), given that this is a roof piece which has been around for thirty years and that Sand Green is a popular colour to use for rooves, to represent verdigris. The set's appeal is lifted by the inclusion of a 2x2 brick in Reddish Brown printed with the Lion of Venice (6142085 | 3003). It's a classy design and I find that there is something pleasingly retro about printed 2x2 bricks! 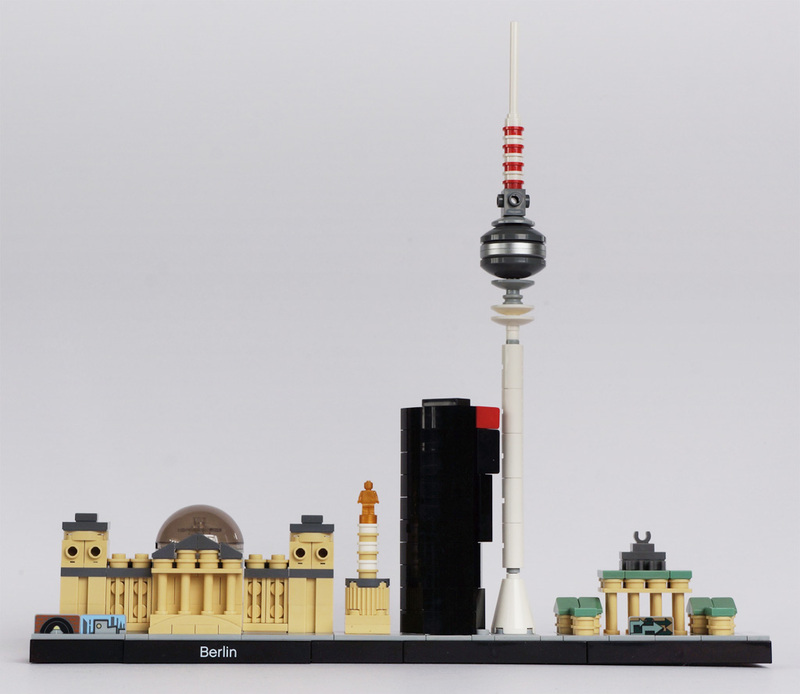 This set includes Reichstagsgebäude (Reichstag), Siegessäule (Victory Column), Deutsche Bahn Tower, Berliner Fernsehturm (TV Tower), Brandenburger Tor (Brandenburg Gate) and fragments of Berliner Mauer (the Berlin Wall). Brandenburg Gate was of course the subject of an Architecture set (21011 ) in 2011. Although the piece count is similar to 21026 Venice, the build in 21027 Berlin is significantly more interesting. It's by no means advanced, but has greater variety in technique and parts selection. Like 20126 Venice, it's a charming build - I enjoyed the Reichstag in particular, especially as the interior of the dome has been included. The Deutsche Bahn Tower has the most interesting construction of the five submodels and its method of attachment to the base reminded me of 21021 Marina Bay Sands . Perhaps these three new sets were designed by the same person: Rok Žgalin Kobe. TLG used to print the name of the designer on the side of the box, but stopped doing this a year or two ago. Prior to this, Rok had been designing many of not all of the Architecture sets of the time and I suspect - and hope - that this is still the case, as he is excellent at it. I feel odd describing the Berlin Wall as being charming and delightful, but that's just what I feel about its appearance in the set, in the form of three printed 1x2 panels. I presume TLG chose to print pictures on the panels as a reference to the East Side Gallery, a preserved section of the Berlin Wall which was painted with over a hundred artworks in 1990. Presumably for reasons of intellectual property, these are not direct representations of any of the works in the East Side Gallery, as far as I am aware - please correct me if I am wrong. In fact I imagine TLG probably went to some trouble to avoid making them look like any of the works! Oddly the booklet makes no reference to the East Side Gallery, instead mentioning the Gedenkstätte Berliner Mauer (Berlin Wall Memorial) which is a section preserved in its original form. 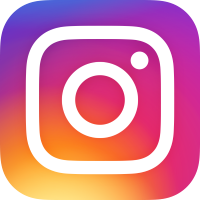 I don't see anything sinister in this possible avoidance of mentioning the gallery; the omission is more likely to do with licensing agreements. Let's start the parts review once again with the minifigure trophy: Victoria the goddess of victory is presented here in Warm Gold [TLG]/Pearl Gold [BL] (6138682) for the first time. She seems to be giving her victorious arm a rest. Arguably the most useful recolour across all three of these sets is the 2x2 inverted tile in Black (6013867 | 11203) which sits at the rear of the Deutsche Bahn Tower. 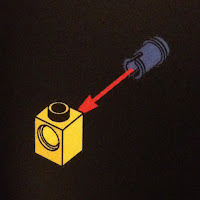 This is only the fifth colour for this part, despite it being introduced in 2012. The aforementioned Berlin Wall 1x2 panels have Element IDs of (left to right in picture above) 6135259, 6135249 and 6135255. It would be fun to use these in a MOC; especially the tunnel image! There are some parts worthy of note for their rarity. The 1x2 brick with groove in Brick Yellow [TLG]/Tan [BL] (6103001 | 4216) has previously appeared in just one set, Minecraft 21114 The Farm , which only contained two of them. In 21027 Berlin we get twelve! Better yet, it wasn't even crucial for the designer to have included twelve; only four of them are visible from the front of the model, so for the other eight regular 1x2 bricks would have sufficed. 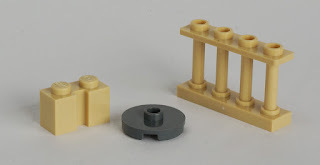 This may have been a cost-cutting measure (the production costs of including twelve groove bricks may have been lower than including four groove bricks and eight regular 1x2s) but I like to imagine the designer was just being kind to AFOLs. The round 2x2 jumper has only appeared in Dark Stone Grey [TLG]/Dark Bluish Gray [BL] (6115080 | 18674) in five sets so far, although I imagine it will be very common soon enough. This 4-studded variant of the 1x4x2 fence in Tan (6066118 | 15332) has only appeared in one other set: appropriately enough that was 21011 Brandenburg Gate. There used to be a similar version of this part which only had two studs on top, but that was also extremely rare in Tan. 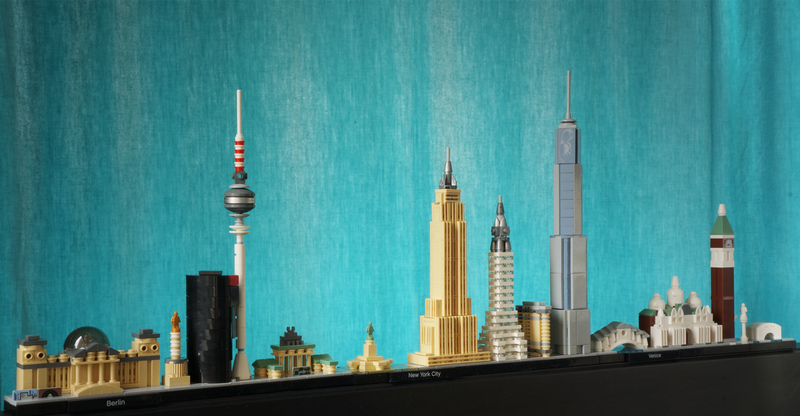 The set includes the Statue of Liberty, the Empire State Building, the Chrysler Building, the Flatiron Building and One World Trade Center. Not one but two of these buildings have previously been represented in their own LEGO Architecture sets: 21002 Empire State Building and 21023 Flatiron Building, and the Statue of Liberty has been represented in both the form of a polybag (40026) and a massive sculpture (3450). This, the largest of the three sets, is also the best building experience. 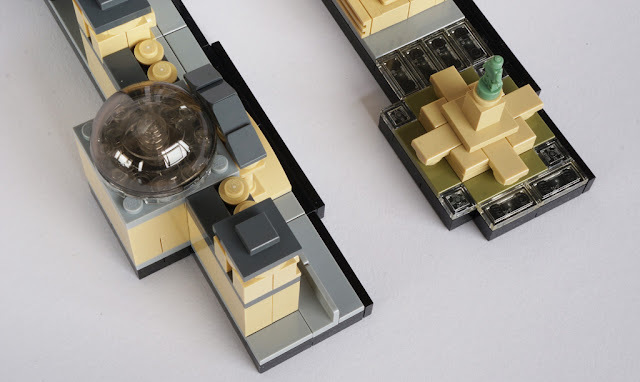 The Empire State Building has a core of SNOT brackets reminiscent of 21018 United Nations Headquarters (another set designed by Rok) and the amount of fine detail achieved in such a small space is quite remarkable - a testament to modern LEGO pieces, techniques and of course instruction development. It also contains 74 1x2 grille tiles in Tan, which come in their own bag! This makes me happy as the grille tile is my favourite LEGO piece. 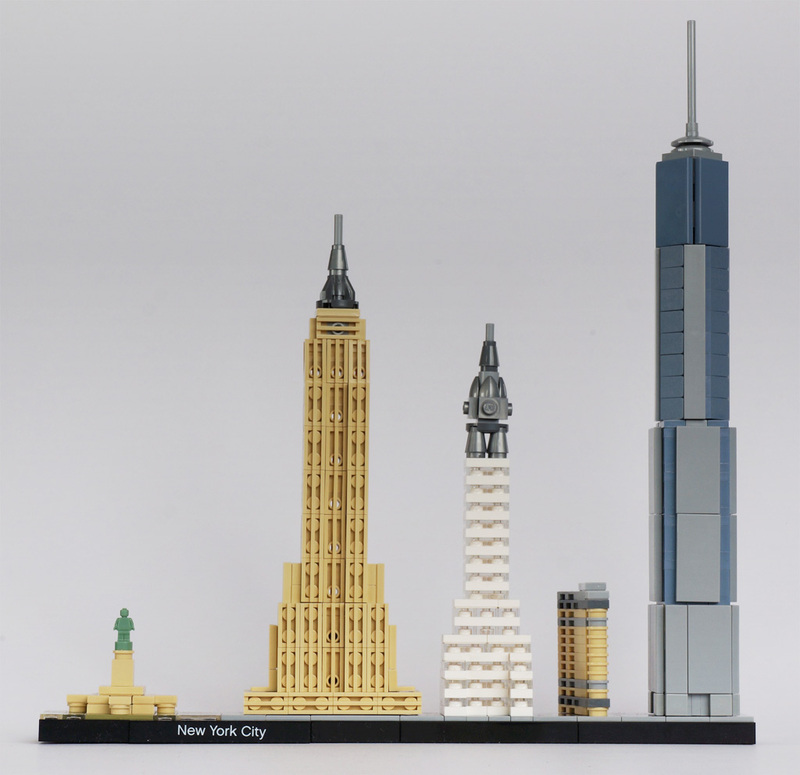 The Statue of Liberty and the Flatiron Building are both cute, fun builds but unfortunately the Chrysler Building is the only real 'miss' across these three sets for me. The 'spire' at the top is great, but the main building made of White and Transparent plates and tiles is too simplistic compared to the other buildings. The colour contrast between building and spire also feels too strong to me. It's a nice enough build though, with the offset technique repeatedly employed to taper the shape. 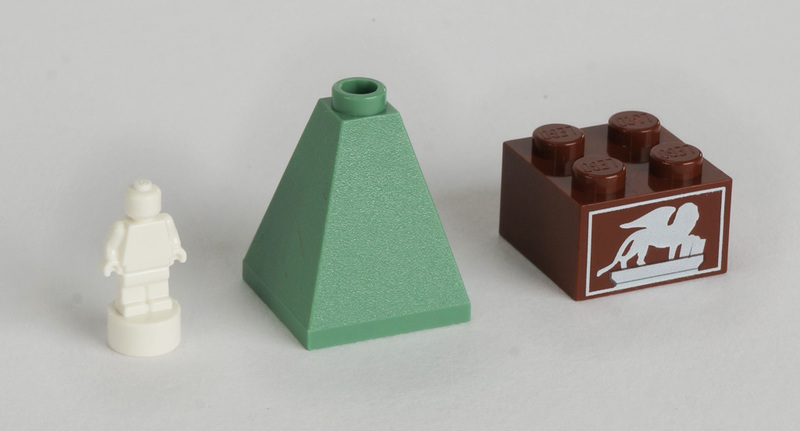 This set's minifigure trophy is of course Sand Green (6138781) in order to represent Lady Liberty, resting. The other new recolour included is the 1x2 plate with 45° slope (a.k.a. the Stafford Slipper) in Sand Blue (6139519 | 92946). Hooray, Sand Blue. If you love Sand Blue you'll love the fact that this set has 32 of these! In fact, I'm going to go through all the Sand Blue offerings in this set as they are all of interest. There was a lot more than I expected, mostly thanks to the 16 1x1 bricks (4620077 | 3005) and the 19 1x3 plates (6142245 | 3623). The former piece is common (there were 43 in 10218 Pet Shop ) but the latter much rarer: 1x3 plates were only made from 2003 to 2005 and the greatest quantity that ever came in a single set was four. Even rarer are the four 1x1 tiles (6138232 | 30039); this part only ever previously appeared in the polybag 3219 TIE Fighter in 2003. There are also four 2x4 tiles (6124349 | 87079); these are not new but this is the cheapest set they've ever appeared in - the others being 10241 Maersk Line Triple-E and 70751 Temple of Airjitzu. The 1x1 cone comes in Silver Metallic [TLG]/Flat Silver [BL] (6121350 | 59900) here and also in 21302 The Big Bang Theory and 75107 Jango Fett . I think the 1x1 tile in Transparent (6047501 | 30039) is still worth mentioning as it only appears in six other sets, only four of which are on general release. Plus, I love 'em. There's another Dark Stone Grey 2x2 round jumper in this set. The 2x3 right wedge plate in Tan (6138230 | 43722) only ever appeared in 4500 Rebel Snowspeeder from 2003, so it's great to have this useful part in a useful colour back once again, and nine are included. The frustration is that this set only requires the right hand wedge, so the left hand version remains rare - at time of writing there is a Dutch BrickLink store selling them for €20 each, and if anything, this new set will cause the left hand version to rise in price. These sets are appealing for a number of reasons. The effect of a compressed city skyline - a common approach in the design of souvenirs - is very cute. The shallow depth of the bases greatly increases your display options, such as in front of the books on your bookshelf or on top of your telly. A common complaint of Architecture sets in general is that the builds sometimes contain repetitive sections; this problem is pretty much obliterated within these sets simply because the buildings are much smaller. Similarly, with smaller buildings you get rewarded for less effort! Having buildings presented in an even smaller scale than usual doesn't lessen the appeal: although they're less detailed, the viewer's mind is more forgiving. Similarly, the wild variations in scale between the buildings seems quite acceptable. Many people love those Architecture sets which are 'parts packs', i.e. they have large quantities of particular elements. 20128 New York is really the only one of these three to fit this bill, unless the 45 Tan 1x1 round plates in 20127 Berlin excite you. The Architecture theme is not for everyone and so I have been interested to note the number of online comments from people saying these will be their first purchases from the line. Conversely, some diehard Architecture fans may find these sets too basic for their tastes. Comparisons will inevitably be drawn with those early Architecture sets of skyscrapers which were overpriced and lacking in detail. I doubt these will be as egregiously priced (as Scott Barnick once put it) but you only need to glimpse at the 77-piece 21002 Empire State Building to know that these newer models have more to offer. 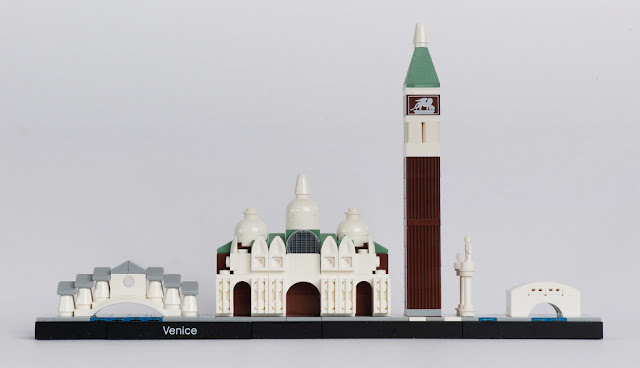 Prices have not been officially announced, but they will be interesting to compare to other Architecture sets over the years - for example, compare two sets with pretty much the same piece count as 21026 Venice: the 2009 set 21004 Guggenheim and 21008 Burj Kalifa from 2011. Both of those had 208 pieces but the former cost $39.99/£34.99 and the latter $24.99/£22.99. Your personal choice of purchase is more likely to be swayed by your emotional connections to the cities portrayed, but emotions aside, each has its own merits. 21026 Venice features ye olde architecture and a homogenous colour scheme. 20127 Berlin is vibrant and varied. 20128 New York is big and more complex than it first appears. In short - the models are all like their real-life counterparts! Our thanks to the LEGO Community & Events Engagement Team for providing these sets. Consider using our affiliate links to buy them in 2016 (or anything); this helps support New Elementary! I have to admit, I hadn't realized how many useful recolors these sets would contain. The minifigure trophies in particular pique my interest—I'm sure there could be plenty of uses for those, though prices might be steep so long as they're only available at a rate of one per set! The black 2x2 inverted tile also looks useful. How many are there in the set? I didn't see it mentioned in the review. I'm not often a Lego architecture fan, but these sets look fantastic, and those parts... I may just end up getting one or two of these! There's only one inverted tile. You get a spare of each trophy though. I am a bit disappointed they went in this direction. The skylines look alright, no doubt, but can we ever again expect a bigger set? Something along the scale of Robie House would be fantastic. Wow!!! Love all the printed parts (especially the 2X2 brick w/ lion)! Referring to the 1X2 plate w/ slope, why is it called a "Stafford Slipper?" I have never heard that before. Probably because no one calls it that but me :) I believe the design was proposed by Mark Stafford, and it looks like a slipper. Thanks! I looked it up after I posted the comment, and there actually is a shoe company that makes slippers called Stafford! Lots of coincidences.